Whether it’s a well earned reward for a job well done or a chance to bond as a group, a Yangtze River cruise provides the right mix of shared experiences and unique adventure. The prices are advantageous, the service is to tier, and the ships compete well with sea-going vessels. Crews are highly trained, courteous and motivated – the staff to passenger ratio is excellent. Attendees will enjoy all the readily available amenities as a solid backdrop for any group activities. 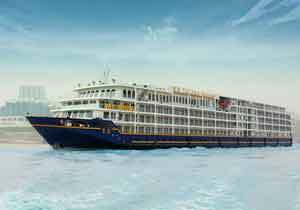 They get a full cruise package with meals, cultural demonstrations and touring in a setting designed to meet the expectations of Westerners. Beds are full sized, ceilings are high and the atmosphere is one of modern convenience. The scenery is amazing, and the cruise takes in the impressive Three Gorges Dam as well as the soaring cliffs and mountains of the gorges themselves. Cruising gives a relaxing and pampered luxury that comes without the hustle and bustle of a hotel based conference and without the concerns about security or safety. The river itself is a tranquil, quiet immersion in rural and undeveloped country, a far cry from the heat and pressures of the humming cities. In some situations, a Yangtze cruise can act as a useful buffer when making the transition from West to East. Used this way, it offers a group a chance to relax from travel while getting into “China mode.” This is particularly advantageous when planning has to be done without the confusion of outside distractions. With a relaxed and receptive group, you can plan talks or presentations on your own schedule. Meeting space is generous. The same facilities used to present onboard entertainment can be used for lectures, award ceremonies or symposiums. Group specific events can be blended with activities normally available to fit your needs. But there is even more to gain. The bonding that comes with a retreat is essential for many organizations. Along with this comes the synergy from simply sharing the cruise itself. Distractions and pressures are minimized while interactions with others can be maximized. At the end of the day, relaxation, recovery and renewal await. Suites have private balconies, rooms have a full bath and shower, and of course, spa treatments and other goodies are included. Small and breakout group settings are available and suites are large enough for socializing.